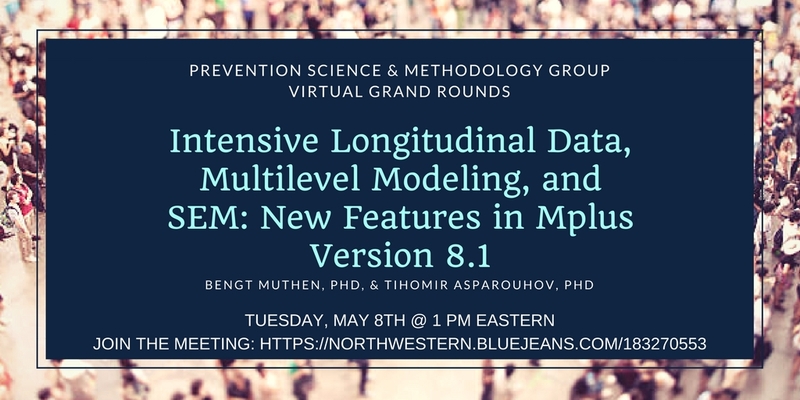 New features in the forthcoming Mplus Version 8.1 are presented by Bengt Muthén and Tihomir Asparouhov at the PSMG Virtual Grand Rounds. This presentation is open to all using your browser or the BlueJeans app, and will be held on Tuesday, May 8th @ 1PM EST. The slides for the presentation are available (Part 1, Part 2). Introduction to Structural Equation Modeling, Toronto, Ontario, Canada, May 10 – 11, 2018. AMultilevel Modeling, Toronto, Ontario, Canada, May 17 – 18, 2018. Scale Construction and Development, Philadelphia, Pennsylvania, May 31 - June 1, 2018. Structural Equation Modelling using Mplus, Sheffield, United Kingdom, June 18, 2018. Click here for the Mplus Version 8 User's Guide and to download the input, output, and data for the Mplus User's Guide examples. Videos and handouts for the 13 topics of the Mplus Short Courses are now available for viewing on the web. Other Mplus web training includes web talks, a seminar series, a one-day overview course, a two-day course, and a 20-lecture course on Mplus analyses.